Joshua Macaroni is 37 years young and has been working with various carnivals for as long as he can remember. As a fourth-generation carnival worker, he grew up on the fairground midways and always knew that continuing the family legacy was in his genes. He had been working in his family’s business, Family Attractions Amusement, since graduating from high school and learned all of the ins and outs when it came to running things. Whether it was setting up and taking down rides, running the rides, or repairing malfunctions, Joshua learned it all. Since 2016, he owns and runs J.J.’s Concessions, which makes some of the best treats on the fairground. Born in Quitman, Georgia, Joshua knows all about keeping the masses happy and provide hours of family-friendly entertainment. J.J’s Concessions specializes in all types of carnival favorites, including funnel cakes, corn dogs, elephant ears, and much more. 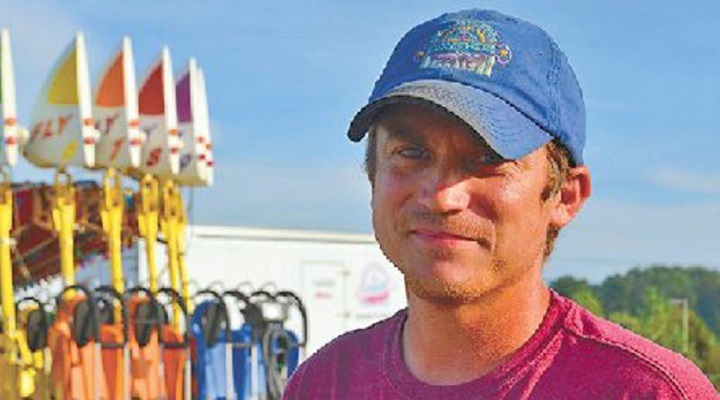 He plans on passing his family business down to his children and teaching them the trade when they get old enough to learn how it all works, assuming of course, they want to continue the tradition of providing family-friendly fun at the fairgrounds. Joshua is in a happy long-term relationship with Amanda and is a dedicated dad to Cole, Tyler, and AJ. He enjoys the great outdoors, including hunting, fishing, riding four wheelers, and building monster trucks when he can find a bit of free time from running things at J.J.’s Concessions. Joshua Macaroni currently lives in Tampa, Florida with his family. He also has a sister, who sells insurance and lives in Atlanta, Georgia with her family. She is no longer in the family business but runs an online store and sells insurance. Like I was saying earlier, there have been four generations of my family, who have been in the carnival entertainment business. So, it was something that is in my blood and that I’ve always known I was going to do when I became an adult. I also enjoy helping people from all walks of life and spending several hours of fun with their families. I am hoping to one day pass this down to my children if this is the path that they want to take. I think they would do a great job in our family business. We make our money by inviting families coming to the carnival. They ride the rides and enjoy the food that we make. The money comes from ticket sales, unlimited ride armbands, food purchases and buying souvenirs. Depending on the number of tickets they purchase, how much they spend on snacks, and how many people come to spend the day at the fair, we get paid based on the turnout. It took us about three to four years before we started making a profit. While we build up a good stream of customers, you’re always breaking even from what you bring in with the costs of keeping your business running and attracting more customers to see what you’ve got. But we worked hard to build our business from the ground up, found the right products that sell well, and get the payments down low enough on our equipment, and any maintenance needed before we brought in the profits. Also, in our type of business, weather plays a huge part in everything. There weren’t any doubts about whether things would work out. I have been in this business all my life, so I got to see things first hand on how everything works. Being a successful business isn’t just about the products you sell or the number that people purchase. It’s also about the person behind the company. If you operate things honestly and stand behind what you do, then you’re always going to see success. I am a huge believer that if you set your mind to your dream and have a good plan to reach that dream, then you are going to get far. You have to keep your focus on your goals and aim for the prize. Well, our first customers drove up, and they saw all the lights, which one of them said, “this looks like fun so let’s play”, so they ended up having a blast. Pretty soon, more and more people were walking up to join in on the fun. Things kept improving from that point, and eventually we had a lot of customers stopping by and enjoying themselves. But I cannot tell you exactly where we were at when our first customer came because there are so many that we have served over the years. There isn’t a business strategy per se in the kind of business we do. Most of our customers come randomly; There were occasions where tremendous amounts of advertising had to be done over several weeks and other occasions where no advertisements were done at all. It depends on where we are, how many people have come to the carnival, as well as the weather. We are usually in a specific area for three to four days at a time and then head to the next spot. Another strategy we have been using that’s helped us out quite a bit too is a Facebook business page. That gives any new and current customers the latest updates to what’s going on with our business. Our marketing guy uses blasts to advertise to people all over the Facebook network, and we try to engage with our customers every seven to ten days, depending on where we are during that time. With everyone using mobile phones and computers with the internet, we saw that using Facebook was the most natural and most efficient way to bring us new customers from all over the country. We have been expanding and hired some new people. But to find the ones who are a good fit can be tough because there are tons of things that would be beneficial to our business. However, knowing whether or not the new employees are going to work out is the tricky part. Our business isn’t your typical 9 to 5 job, not many people can adapt to our work conditions. So, you have to be on the lookout for specific traits when looking at hiring the right people. There are a few things that have led to my success in this business. For one, I have the drive to be successful, and I do not let anything get in the way of me achieving my goals. Next up is the experience I have in the business of amusement parks, and dedicating many years of my life to perfecting it. Last, and most importantly, the support of my family has helped me with my success. Whether it’s something business related or providing me support in another area of my life, they are always with me no matter what. There are a ton of satisfying moments that I’ve experienced with my business. But the most satisfying to me is watching all of my customers walk away with a smile on their face. When you know you’ve succeeded in giving another person a bit of joy, then you are rewarded with the feeling of accomplishment in making someone’s day great. At the end of the day, helping other people achieve a happy and memorable experience will also help me and my family. Hopefully, the future holds a lot of success for my business and that I can pass this on to my children. We can never entirely count from one year to the next because the number of customers we get every year varies based on a lot of factors. Because we are an outdoor business, the weather can affect how things go from day to day. The best thing we can do is to stay positive and hope that the weather doesn’t negatively change us. This way we can maintain the income we made in the previous years. There aren’t any business books that have inspired me. Not because I dislike any of them, but because I honestly do not know. When I do get a chance to sit down and read something, it’s usually the Outdoor Amusement Business Association newsletter, but they are a weekly digital feed, and I tend to read the news or trends in the industry online. What inspires me to do better is by seeing the success I already have. The one recent purchase we made that has helped us a lot in our business, is a winter facility, so we can work on our equipment and make sure it’s in tip-top shape for the following season. It’s a manufacturing facility in Mulberry, Florida that we are using to keep our machinery in perfect running order. Without that, then something can malfunction, which could hold us liable if it’s not working correctly and we don’t keep it in order.